After five nights braving the elements in sleeping bags outside the Rowe Management Building, eating only food offered to them by others and leaving their station only to attend classes, a group of students from the Dalhousie Commerce Society received exciting news: they had reached their goal of raising $10,000 for Phoenix Youth Programs. The students were participating in 5 Days for the Homeless, a national campaign started by business students at the University of Alberta in 2005 to raise awareness about the prevalence of homelessness in Canada, and to raise funds for various organizations that help those who are homeless or at risk of becoming so. Students from 19 universities spent five days and nights outside this year, collecting donations for their community organization of choice. The six main student sleepers at Dalhousie were Flanagan, Madelaine Clerk, Carolyn Silver, Emily Hanaka, Eric McTaggart and Yazeed Esnan. Each night a different “guest sleeper” joined the group as well. 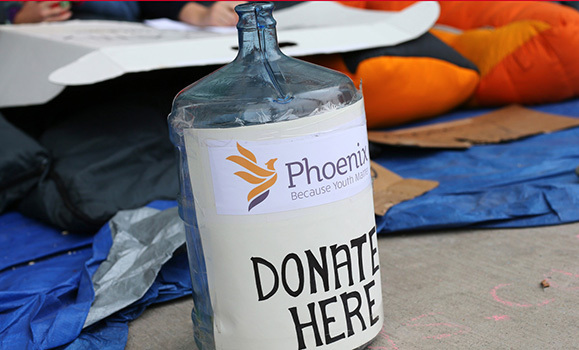 Alongside their fundraising goal, a major goal for the team was to start conversations and spread knowledge about both homelessness and Phoenix. Flanagan, who has participated in 5 Days for the last three years, notes that as students, “it’s important to give back to a community that has given so much to us.” The group, says Clerk, wants to make sure that students walking into the Rowe are aware that just a few blocks away there is a Phoenix drop-in centre. Dalhousie’s 5 Days students have been supporting Phoenix for years, and Flanagan and Clerk have great respect for the organization. Flanagan recounts the students’ tour of the shelter and the drop-in centre, noting that the staff are “phenomenal,” generous and caring. The students can be proud of their success in raising both funds and awareness, but they stress that this project isn’t about them. Flanagan says that over the years she’s participated in the event, she has learned how generous both the Dalhousie and Halifax communities are, with people constantly coming by not just to donate, but also to ask the students if they need anything. 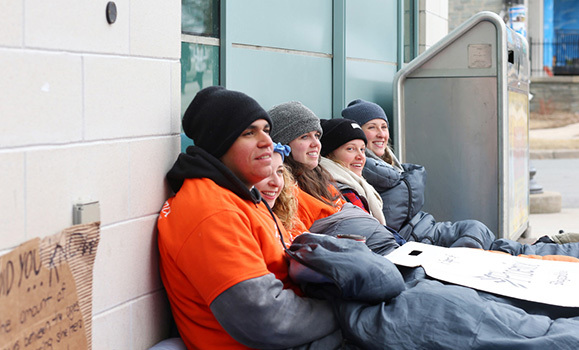 Donations to Dalhousie’s 5 Days for the Homeless campaign can be made online until March 31.